Simple Wellness is hosting an open house party for all of our clients and members of the community on Saturday, April 12th from 10am to 5pm at our spa to celebrate our first year in the historic area of Mount Vernon Baltimore. This spa and wellness party is an opportunity for me, Angela Hardy, owner of Simple Wellness, to thank you for making our first year in Mount Vernon such a wonderful experience and success. It’s also an opportunity for you to meet and mingle with our local business partners and our team of experts, including our director of nails, director of massage therapy, director of skin care and skin care specialist, manager and cosmetologist, natural hair stylist, hair colorist and our massage therapists. There will be raffles throughout the day with prizes worth hundreds of dollars and goodie bags filled with product samples. We’ll be offering tours of our facility, expert advice on natural hair care, demonstrations on applying makeup, and free massage sessions. We’ll teach you healthy and natural ways to take care of your nails, hands and feet and how to get glowing skin just in time for summer. The event will also offer light fare and music to celebrate the 12 months our store has been open in the area. Simple Wellness Day Spa is located at 519 Charles Street, Baltimore MD 21201. 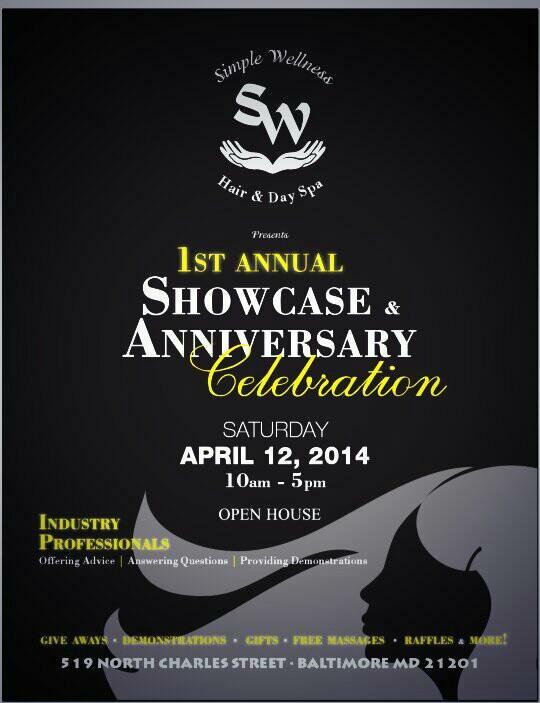 Simple Wellness’s First Anniversary Open House celebration is Saturday, April 12th starting at 10am. See you there! Parking is available on the street via metered parking. General parking is also available at the parking lot located directly across the street for $8 (exact dollar amount is needed).